- with a mobile application! - while configuring Di2 electronic shifting. - is compatible also with this setup. There is also another e-tube app called e-tube ride. - from the bike to your phone using Bluetooth LE. - which you can see in the bike display. - for instance the level of assistance. - which is made for configuring the system. - and install the e-tube project app. - and updates itself if needed. - six digit key which is 000000 by default. - for instance when you leave it unattended. - but you need it in case you have to connect with another phone. - when switching the power on. - that SCE7000 is ready for connection. - and then the Shimano Steps logo. Now we have the bike and the phone connected. - let us first have a look on firmware update. - which is recommended so the bike works as it should. - or modifications on the way. - have their own software. In this case they seem to be the latest version. Let us then jump to customize menu. - i.e. the motor - the heart of the e-bike. - and the highest level Boost. - is now renamed as Dynamic profile. - Trail is Low and Eco is Eco - you can not change that. But the Boost and Trail we can. Namely there is another profile Explorer. - and Eco is Eco as it was before. - the both modes have different scales. Boost Medium is higher than Trail Medium. - and you do not need the maximum Boost. - to use all the time. - that it is made only for the toughest situations. That could be one idea to use this Explorer mode. - from three levels - low, medium and high. - until we change them again with the app. - on different types of trails. - by configuring the bikes with different settings. - so we can choose the data which is shown. - for instance this cadence here. Then we just save the settings if we changed them. - if we like for some reason. - there would be more options in the menu. The same functions we have gone through in other videos. - the display looks again normal and that's it. 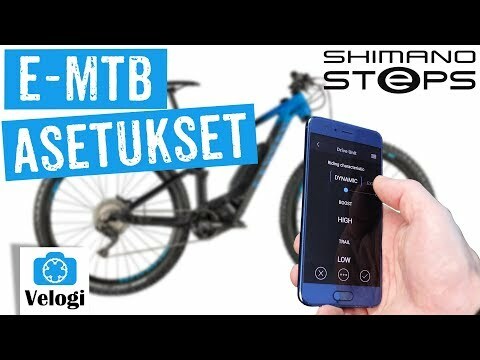 That is how to configure Shimano Steps system! Press the thumb up if you found this interesting! See you next week - bye bye! - and official service shops.